I’ve always heard that there is a mind-body connection that impacts all aspects of our lives—both at work and at play. Over the years my yoga teachers said so; my healer-colleagues said so; my more athletic friends said so. According to them: When your mind and body are in balance, working together in harmony, you are at your best no matter what you choose to do. In his book Healing Back Pain: The Mind-Body Connection, John Sarno writes about the potentially painful condition he has identified as Tension Myositis Syndrome (TMS) which he believes is at the core of much of the back pain (among other things) diagnosed by doctors. In a nutshell, Dr. Sarno believes that the tension caused by repression of common emotional issues such as anxiety, stress and especially repressed rage leads to pain in the muscles, nerves, tendons and ligaments resulting in back and other pain. While Dr. Sarno’s theories are controversial, he has presented clinical data which supports his conclusion that when patients focus on and deal with what may be upsetting them in their unconscious, their pain will dissipate. I guess I “believed” all of those experts or at least I knew that they believed what they were saying. It was that way for years…. until the day after my last birthday. My birthday this year knocked me for a loop. No real reason. Everything in my life seemed to be going great. My son and his wife had moved geographically closer. I was helping my daughter and her fiancé plan their wedding. My husband and I were looking positively at our next steps. I was refocusing the direction I wanted my business to take and I was re-writing my website as a move to make that happen. Yet, somehow, none of that seemed to matter. I was blue…very, very blue. Now for me, birthdays (mine and others) always have been times for celebration. As a matter of fact, I would start to celebrate my birthday in mid-January (right after my husband’s birthday) and go right through the months until mine. Not this year…and it wasn’t even a “big” birthday. So, what does all this have to do with the mind-body connection? Well, this was the first time in my life that I really recognized the mind-body connection at work. It was remarkable and I’m going to do whatever I can to remember what I’ve learned and share it with anyone who will listen. Over the past year or so I have had a number of foot surgeries and have been in physical therapy to rehab my feet. (I will hike again!!!). One of my exercises required me to pick up about 18 marbles (big and small) with my toes—pick up a marble, hold it for a few seconds, cross over my other leg (still holding that marble) and drop it into a small container. I was supposed to do the exercise (picking up all the marbles each time) for three repetitions with each foot. After six weeks of physical therapy, I had become a pro and was very pleased with myself—except for the Wednesday before my birthday. Although I went to physical therapy on that day, I was in a funk. I started my PT and even the easiest of exercises—the ones I could basically do on Day 1 of PT were a struggle. It was finally time for the marbles. Ok, I thought, this will give me a boost. It always does. Except this time I couldn’t do it; not one marble. Try as I might, and believe me I was trying, I couldn’t pick up a single marble with either foot, not even the easier small ones. I couldn’t believe it. I kept trying, first one foot, then the other, over and over again. I couldn’t get one damn marble up off the towel. After 15 minutes, with sweat dripping down my face, I gave up and moved onto something else. Dejected, I went home after physical therapy and looked at my task list. It was overwhelming. Easy, everyday tasks seemed just too hard. My mind-body connection was askew and now it was really interfering with my life (although at that point I didn’t know what was getting in my way.) I just felt like I was not in control; I couldn’t motivate myself to do anything—not even the tools that I knew could potentially help. Boy was I down! That was Wednesday, the day before my birthday. I woke up on my birthday still feeling blue. My coach called to wish me a happy birthday and I talked about what this birthday, this point in my life meant to me. I realized that I was about to enter a new phase in my life—one not governed by scheduled surgeries. Now it was about me and what I wanted in life. I was at yet another transition point and I was a bit scared, overwhelmed and confused about what I wanted this next period to look like…and I was frustrated that I was back in transition, having to chart my own course once again. The next day, Friday, two days after my birthday, I woke up feeling better. The world wasn’t bleak. I no longer felt like wallowing in whatever I had been wallowing in. I felt good. I went to PT wondering about whether my toes would work. Would I be able to pick up the marbles? I did my beginning stuff and now it was time—me against the marbles. I looked at my toes, I gave them some words of encouragement and I reached for the first marble. I chose the biggest one, the one that usually is most difficult for me, and up it went. I held it; I carried it across my body and I sent it to home. I smiled. 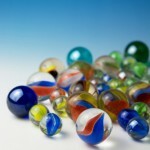 I did it again and again until I had done 3 repetitions (all 18 marbles) with each foot. 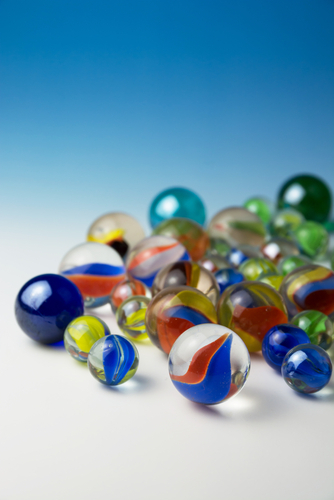 No marbles dropped; none rolled across the floor. I WAS BACK! Talking about my frustrations and anger had released something. Suddenly, without my even realizing it, my mind and body were in balance. They were connected; they were working together and I could count on that synergy. So, I’ve become a believer. Now, when I see the visual cue that I am not performing at my physical best, I know that I ignore that message at my peril. Similarly, when I feel blue, I know that figuring out what is getting in my way is really important. Sometimes it can be addressed by doing something physical that I like—taking a walk, gardening, even cleaning out a closet. Sometimes it takes writing in my journal, talking to my coach or getting whatever help I need. Bottom line, I remember that there is a connection between how I feel physically and what’s going on in my mind and I use that information to take steps to improve my well-being. I know that I can regain control and make choices about how to deal with the situation. I know that getting my life in focus—my body and my mind in balance—will definitely help—whether I’m at home or in the office. This entry was posted in Attitude, Blog and tagged attitude, life coaching, mind body conncection on September 1, 2014 by Barbara Kessler. The greatest lever for change is awareness.